At the most basic level, a dialer is a system that places outbound calls from a contact center to customers. The aim is to reduce the cost of placing phone calls by removing a lot of repetitive and error-prone work. Dialers also improve efficiency by directly connecting agents to customers as they become available. Automated dialing means that contact center agents don’t spend any time physically inputting telephone numbers; that way they spend more time talking to customers. What does a dialer look like? While early dialers were pieces of hardware, these days they’re much more likely to be software-based. 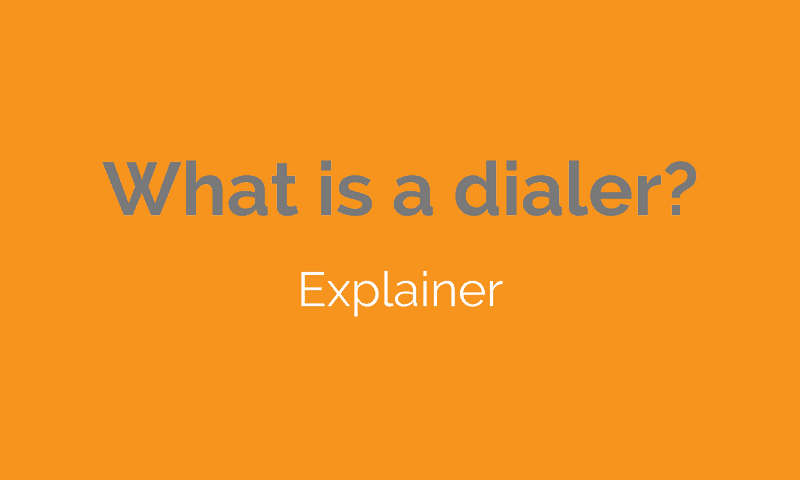 Beyond that, the definition of a dialer is quite fluid, and expectations vary about how they should function. There are also a lot of different categories of dialer, which focus on various areas of performance. To add additional confusion, there is seldom any agreement around what these different types of dialer should be called. For example, one common category is called the ‘Power Dialer’. Which means? Well, not much really. ‘Power Dialer’ is just a (slightly macho) marketing term for conventional types of automated dialer. So what are the other kinds of dialer? Probably the most important variation on the dialer is the ‘Predictive Dialer’. A predictive dialer calls multiple numbers at the same time, using an algorithm to detect when an agent will be available, and also the likelihood of reaching a callee for an agent. As with all dialer technology, the aim is to waste less time. Wasted time can also be reduced through a variety of supporting technologies that detect answering machines, busy signals, or numbers that are no longer in service. Ideally, a dialer will be deeply embedded in the business’ surrounding technology and processes for making calls. In many ways, a modern dialer is only a tiny part of the overall solution needed to create integrated communications processes for sales, service and other parts of a business. For example, a customer may be scheduled for an outbound call based on an online query. But what if the customer makes an inbound call first? Or what if they have already had an email conversation that dealt with their issue? An automation is required to remove the (now unnecessary) outbound call from the schedule, or to provide the latest information to the employee. Otherwise, the intended efficiency gain of the automated dialer is turned into an overall negative: the consumer is confused, and the employee’s time is wasted. In a modern multichannel context, an entire set of integrated processes is required to ensure that the dialer takes data from other systems into account. The purpose of dialers has moved over time as new capabilities have been added. The first dialers were only capable of working through a list of contact numbers. They didn’t change without manual intervention, and they didn’t make predictions. Without additional behaviours or contextual information, their only real purpose was linking sales staff to potential prospects for telemarketing. In contrast, a modern dialer can be programmed with an enormous amount of contextual data, and deployed for practically any campaign. This includes after-sales calls, lead nurturing, or proactive customer service. Unfortunately, the early uses of dialers have contributed to a generally negative public perception of practices like cold calling. Although dialer solutions are now very advanced, plenty of contact centers still use dated technology. This leads to some concerns about the use – or misuse – of outbound dialers. For example, call centers may place more calls than they can handle, leading to silent or abandoned calls. Many territories around the world now have strict guidelines in place to prevent so-called ‘nuisance calls’. In the UK, Ofcom and the Information Commissioner’s Office have dramatically increased penalties for silent or abandoned calls. In other countries there are usually regulations with similar intent. But while this has cost some companies a lot of money, it’s generally good news for the industry. By raising the standard of practice, watchdog organizations are making life harder for businesses that damage the reputation of contact centers, while also protecting consumers. What processes are dialers used for? Nowadays dialers are integrated with all kinds of business processes. When a consumer requests a call-back through a website, it’s likely that the call-back is processed by a dialer integrated with CRM, the company websites and other systems. If a consumer gets a call to check that they have not been a victim of fraud – perhaps because a warning was automatically generated from unusual activity – then that’s also most likely done using an integrated dialer. Of course, dialers are used by sales teams, including cold calls and automated outbound messaging. But the list of applied processes is very long, and goes well beyond sales; account reactivation, customer retention, proactive customer care, and debt collection are just a few. In many cases, the calls generated by the dialer are either requested by the consumer, or, in the case of debt collection, essential to the functioning of a financial service. How do integrated dialers work? There are essentially two approaches to integrating dialers into the other systems and channels. The first is packaged dialers which have pre-built integrations for common tools, particularly for CRM systems. This mainly benefits very small teams and simple use cases. The second approach allows components of a dialer and the surrounding systems to integrate freely with any other system. When teams need more flexibility and have complex processes requiring ongoing optimization, this approach is usually preferable. The key thing to note is that the dialer itself – the function placing and connecting calls – is just one part. It’s the integration and process automation around the dialer component that actually enables businesses to communicate in sales and customer service.